Review Summary: Saxon tries for a more commercial approach, and thanks to a few choice tracks, the result isn't half bad. If you mention bands like Black Sabbath, Judas Priest, Motorhead, Metallica and Iron Maiden to the general populous, they may have never heard a note of their music but they would have at least a decent idea of who they are: "Motorhead" they got that guy with the mutton chops and raspy voice right"... Black Sabbath" they got Ozzy and write dark and scary music... correct"" Mention Saxon to a non-metaller and more than likely they would give you a a blank stare. Saxon is a hard hittin, hard rockin NWOBHM band. They could best be described as lying somewhere between Motorhead and Judas Priest. They have a no frills, minimalistic music style, yet sport a very talented guitar duo along with a soaring and powerful vocalist. Their seminal albums Wheels of Steel and Strong Arm of The Law vaulted them into popularity and for a brief period Saxon went head to head with the likes of Maiden, Priest, Motorhead, Accept and their other European contemporaries. Unfortunately, Some sub-par releases and constant line-up changes plunged the English metallers into obscurity for the rest of the 80s and 90s. They would eventually come back strong in the 21st century with exceptional works like Unleash the Beast and Lionheart, but those stories are for another time. Today, we're talking about Crusader, Saxon's sixth studio album. 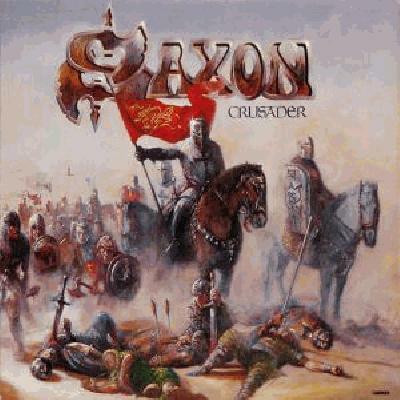 Crusader is considered by many to be the last release of Saxon's classic era, and is often overlooked by the heavy metal crowd. Why" Because it took a more commercialized musical approach than their previous efforts and had the misfortune of being released in 1984. Powerslave, Defenders of the Faith, Ride the Lightning, Last in Line, Don't Break The Oath, Balls to The Wall... the list of seminal heavy metal records goes on and on. The album sold 2 million copies, but was quickly buried under a title wave of other more popular records. This leaves Crusader as one of the most overlooked albums of the 1980s. That's enough history for now, its time to find out whether this thing is worth unearthing and adding to your collection, or better left buried in the bargain bin. The first thing worth mentioning about Crusader is the production. This album is very well produced, you can hear everyone well. As a bass player i can appreciate that the bass isn't relegated to background noise, its right up there with the guitars. The drums sound pretty good too, the kick drum and toms have good depth and the snare drum has a nice pop (see Just Let Me Rock). The guitars sound as good as ever with some catchy riffs and electrifying solos, and Biff really shines by showcasing his vocal prowess. He hits some impressive high notes, surprisingly good low howls and almost everything in between. So what does the album sound like" If nothing else, Saxon is known for being consistent. A lot of tracks would be right at home on Wheels of Steel or Denim and Leather, but there also seems to be some tracks that wouldn't seem out of place on a Def Leppard or Van Halen record. While the first half of the album tends to consist mostly of the classic Saxon sound, the second half definitely attempts to emulate mainstream 80s rock. This isn't to say the later half of the album is bad. Its pretty catchy, has some impressive solos and melodies, but is overshadowed by the excellent first half that sports far more interesting songs. For example, the prelude and title track converge to form a nearly 8 minute epic depicting the Crusades in graphic detail. It's quite a different look for Saxon, but is extremely well done. Song lyrics on this album is a bit of a mixed bag. Nothing is too bad, but some song thematics are a bit repetitive and can wear on you a bit. Again, the first half is mostly well done. The title track, A Little Bit of What You Fancy and Sailing to America are wonderfully written. The later half of the album is not so good. Saxon must have suffered from some writer's block and only had one word on their mind, can ya guess what it was"
Exhibit A: I was born to rock n' roll! Exhibit B: Just let me rock! Just. Let. Me. Rock! Exhibit C: Bad boys like to rock n' roll!.... If ya wanna rock just let me know. Exhibit D: Ready to rock! Rock City! Rock City! Overall, Crusader ranges anywhere from good to great. The transparent commercialization present on some tracks is definitely going to annoy some metalheads, but if you enjoy some mainstream 80s rock every now and again (like i do), then it shouldn't be too much of a problem. There is something on this album that every fan will appreciate, and if you have even a passing interest in Saxon I would recommend picking this album up. First Review! i meant to use bold, italics and the like, but im not particularly talented quite yet. suggestions and criticism are both encouraged and appreciated! im hoping to do Motorhead's March or Die if this one goes well. Good first review. I'm seeing these bums live this week with Priest! Solid review, especially for a first. Have a pos. Rating seems correct. This was my favorite Saxon when I first got into the band. "They would eventually come back strong in the 21 century"
put a "st" next to 21. Aside from that, awesome review man, especially for your first. I've not listened to this album yet, but I have listened to "Sailing to America", and it's an excellent song in all honesty. yeah i noticed that shortly after i posted it. my internet is kinda sketchy at this hotel, once i get a more stable connection ill go through and fix it up. Thanks for all the kind words! Pretty solid first effort mate, have a pos. Tbh I don't enjoy this particular album that much. It has some k tracks, but I prefer their 1980-81 triplet, u know - Wheels..., Strong arm..., and Denim. bit of a let down after the Superb Power and the Glory. Always loved the cover art. Just let me rock! Believe or not I saw this tour with Maiden and Fastway! Thats awesome! i've only heard the title track and Redline from Power and the Glory, sounds pretty good! that album is in need of a review too, if i can find a copy i might take it up. Good review. The only Saxon album I've heard is Wheels Of Steel. Not a great fan of this release. It probably suffers due to the quality of it's predecessors: Wheels... Strong Arm... and D&L, but i thought Crusader was the beginning of Saxon's decline. This album has only gotten worse for me since I first heard it. Especially when you consider the year in which it was released and the four albums preceding it. Lionheart was the album this should have been. I can identify with your first sentence. Used to be one of my favorite albums of theirs but for some reason it just grew off me. Are u gonna review the last one manosg? Jammed a couple of tracks and seemed pretty solid. Really? Haven't checked it yet but I expect it to be solid yet quite unspectacular. If I had to put my money on someone, it would be on linguist2011. I guess he's preparing a review as we speak. Actually, I'm writing something for the new Leaves' Eyes just to break the monotony of reviewing albums I enjoyed haha. haha that one should make up for a good read. yeah, I mean, the 2 tracks I heard were strong, nothing life-changing, but enjoyable for some old school metal craving time. The thing is that even for Leaves' Eyes standards, the album's too cheesy and don't get me wrong I love some good cheese but not when I get Eurovision vibes haha. edit: Just realized you were talking about Saxon haha. Gonna give it a listen right now and let you know in a while. Damn, Voivod also mentioned something about the Eurovision sound in the Orphaned Land thread and now if anything sounds remotely bombastic I get that same feeling, so I know exactly what you mean.